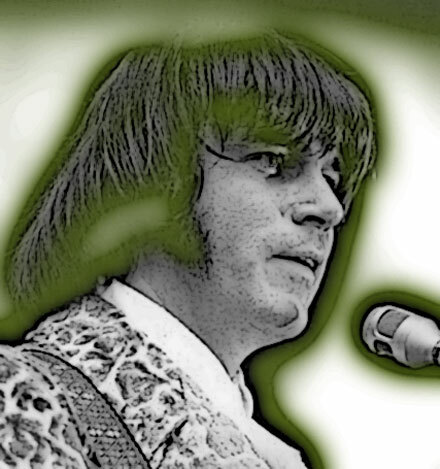 The song I bring you today is a very far-out and somewhat uncharacteristic (yet very groovy) effort by one of my all time favorite artists, the mighty Joe South. 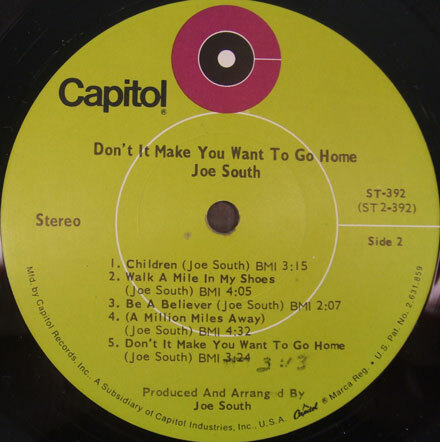 South, one of the preeminent songwriters of the 1960s with a criminally overlooked recording career of his own (his Capitol LPs are essential) is known mainly for that intersection of rock, soul, R&B and pop that was all over the American south in the 60s, with folks like Tony Joe White, Bobbie Gentry and South himself crossing all kinds of stylistic borders. Though South’s oeuvre was marked with occasional psychedelic touches (though no more so than most pop artists of the day) the track I bring you today is a full-on, trippy soundscape. ‘A Million Miles Away’, which appeared on the 1969 ‘Don’t It Make You Want To Go Home’ LP sounds like it had it’s genesis in a studio guitar jam, and grew into something a lot weirder. 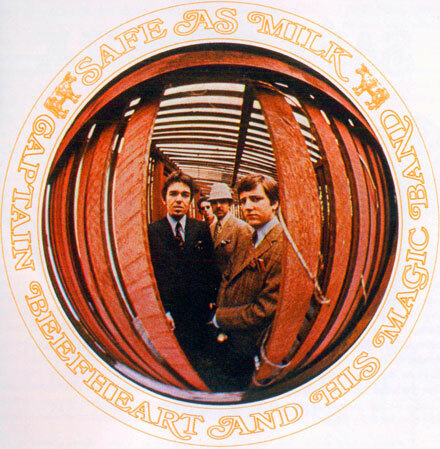 Here we have South’s guitar, aided by percussion, dancing from stereo channel to stereo channel, wrapped in reverb and echo, and culminating in a recorded phone call where South himself calls the White House, asking to leave a message for President Nixon from the “hip community”. It’s unlike anything else on the album – which is packed with great songs, including the hit ‘Walk a Mile In My Shoes’ – or pretty much anything else South ever did. The cool thing is, that the song/sound collage is genuinely trippy. 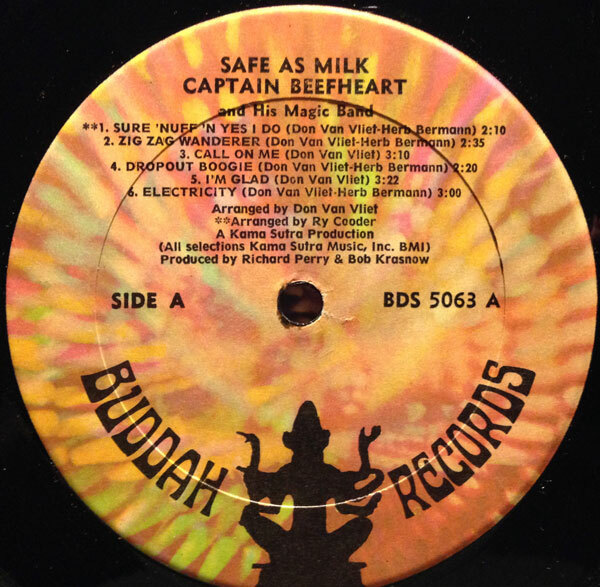 I picked up the record you see before you years ago on a trip to Pittsburgh, which proved to be both an interesting city, as well as fertile digging ground. I know little more about Aerial Landscape now than I did when I first pulled this 45 out of box and bought it “blind”. 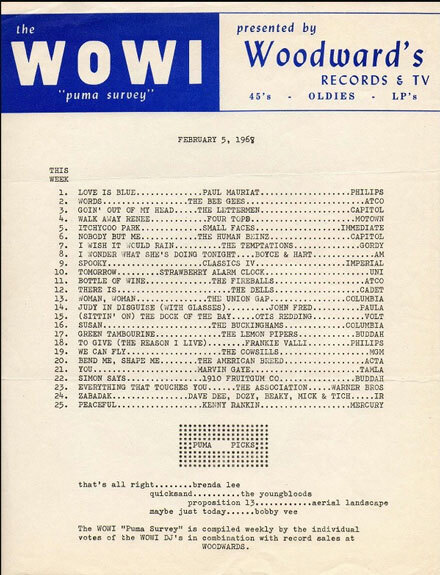 The group apparently released two 45s for RCA in 1968, both produced by Rick Jarrard and arranged by George Tipton (both of whom had worked on Harry Nilsson’s records for RCA during the same period, which is why I bought the record). Their brief discography includes three originals and a cover of Joni Mitchell’s ‘Both Sides Now’. 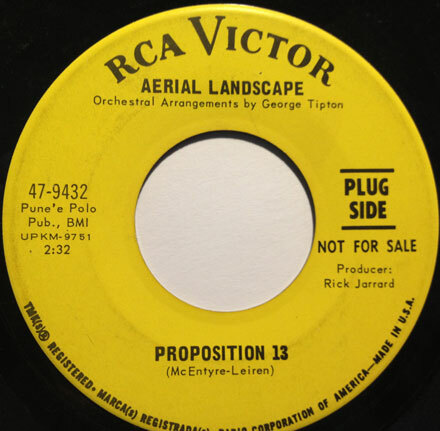 The Aerial Landscape sound is a mix of sunshine pop and folk rock, with the vibe straying into Free Design territory, especially on the first track I bring you today, ‘Proposition 13’. Though there are singers of both sexes, the female singers are more prominently featured and the arrangements by Tipton are typically stylish. The flipside of the 45, ‘Are You Sleeping’ has a slightly dreamier feel, with an opening guitar figure that sounds like it was lifted from ‘Guinnevere’ by Crosby, Stills and Nash. 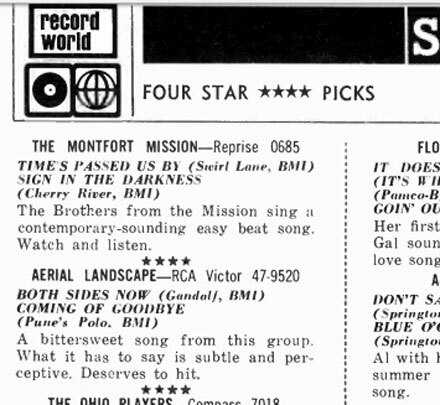 Other than a single chart appearance – where they fit into the milieu quite nicely – and brief reviews in Record World and Cashbox, the Aerial Landscape seems to have left nary a trace. That said, it’s a groovy 45, and I’ll be on the lookout for the other one.